Sky Survivor is a duel minigame found in Mario Party 5. The players, riding their vehicles, appear on the screen in front of a Fishin' Lakitu who sets the start of the minigame. This minigame takes place in the sky above the clouds. 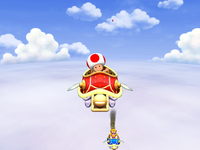 Both players ride Koopa Shell-shaped machines, which have small wings on each side and are either red or blue. The players' objective is to avoid the obstacles found in the minigame's course. The first player to deplete all of his or her HP is the loser. 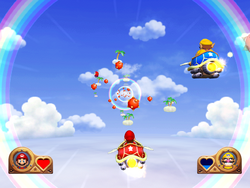 The minigame consists of the two players flying through rainbow rings that use most of the screen. The race begins when Lakitu gives the signal. Both players must maneuver their way through the tunnel without being hit in order to not lose any HP. During the course, there are floating clouds with palm trees growing off them, as well as Fly Guys and Paratroopas in the background. The obstacles found in this minigame are red spiny balls. As the competitors fly further into the "tunnel", more appear, making them harder to dodge. The HP is represented by a small heart-shaped figure. When the player is hit, this heart loses some of its color on top of it. The player riding the red machine is represented by a red heart, while the one riding the blue machine gets a blue one. Once one of the players is hit five times, the player's HP is depleted and the player's machine starts spewing smoke and falls. The winner waves and the match ends. If both players manage to avoid the barrage of obstacles, they fly through a sky temple (the finish line). If this happens, the player with the most HP remaining wins. If both players have the same amount of HP, both machines falter, rendering the match a draw. The winning animation for Toad. The player who either loses all health or reaches the end with the lower health has the engine smoke. The losing player then descends and the winning player then waves at the camera. Rules – "Avoid the obstacles flying at you while riding on unique flying machines." Advice – "The controls are set up like an airplane, so up is down and down is up. Don't forget!" This page was last edited on October 31, 2018, at 15:56.